We often receive e-mails or messages from members of the public inquiring about tornadoes or wondering if what they have witnessed could have been a tornado. In short, Ireland is not immune to tornadoes, and even if they are sometimes referred to as “mini-tornadoes”, they are still tornadoes. In fact, the term “mini-tornado” came into use to distance these tornadoes from the larger ones recorded in the U.S. and other countries. However, all tornadoes can be dangerous and on average there are 10 occurrences in Ireland each year. Generally speaking, tornadoes are associated with the Mid-West or South of the United States, regions which are nicknamed Tornado Alley and Dixie Alley respectively. In these areas, very strong tornadoes mainly occur in spring and early summer, often causing tremendous damage and loss of life. Elsewhere, Bangladesh has a history of devastating tornadoes; the deadliest of these killed an estimated 1300 people in 1989. Due to poor infrastructure and warning systems Bangladesh accounts for five of the top ten deadliest tornadoes on record. In Europe approximately two to three hundred tornadoes per year were reported on average over the past few decades. The low countries, Germany, Southern Scandinavia, parts of Italy and Central England have the highest reported occurrences. May 24th 2016, south of Dodge City, Kansas, U.S. Photo credit: Paul Downes. In comparison, Ireland has had a relatively small number. The Irish tornado records include an interesting note on what was believed to be Ireland’s first documented tornado which occurred near Rosdalla, Kilbeggan, Co. Westmeath on the 30th of April 1054 and is documented in the Annals of the Four Masters, Chronicon Scotorum. Traditionally, supercells – a type of thunderstorm with a deep rotating updraft – are necessary to spawn the strongest tornadoes. Supercells are extremely rare in Ireland and thus landspouts (i.e. 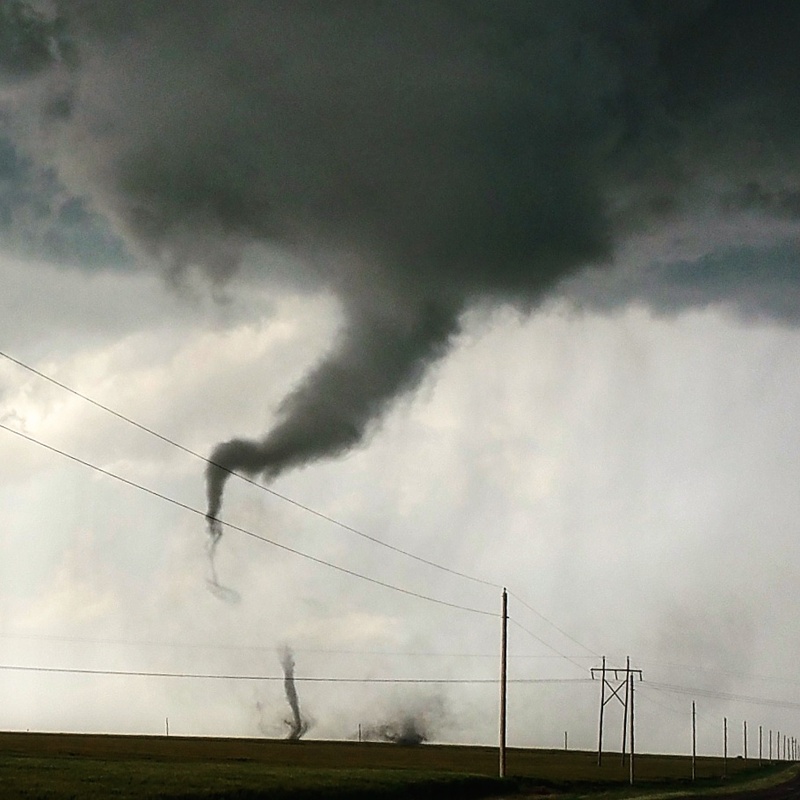 weak tornadoes not associated with a supercell) are more common. Landspouts are often generated along squall lines or associated with briefly energetic cumulus clouds. Funnel clouds also form in Ireland – those that do not come into contact with the ground or other surface are most common. Funnel clouds consisting of a violently rotating column of air, which is in contact with both the ground or surface and the base of the cloud, can be classified as tornadoes. Landspouts are often 20-100 m in diameter and have wind speeds of 60-180 km/h. In comparison, the widest tornado on record at 4 km wide occurred near El Reno Oklahoma in 2015 and the strongest on record, with wind speeds of 500 km/h, occurred in 1999 near Bridge Creek Oklahoma. While summertime is marginally more conducive to the formation of tornadoes, the risk in Ireland, though low, spans throughout the year. Most tornadoes here are weak and brief and many occur without being noticed.